SAN JUAN — Police in Puerto Rico have arrested a 17-year-old suspect in the armed robbery and shooting of tourist Kendric Tyler of Alaska. 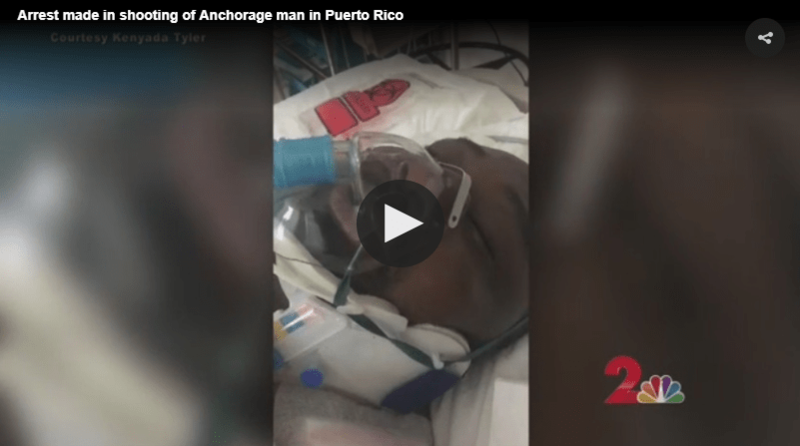 Tyler and his wife Kenyada were robbed May 1 near a convention center in San Juan after wrapping up a cruise to celebrate their one-year wedding anniversary. Kenyada Tyler said that her husband is now paralyzed from the neck down and that doctors do not believe he will regain use of his arms and legs. Kendric has moved out of the intensive care unit and plans are being made to transport him to South Carolina or Georgia, where he can receive specialized care and be closer to family support. Police would not name release the suspect’s name because he is a juvenile. Law enforcement officials did say the youth is suspected of similar crimes, although Tyler is the only victim to be wounded. The 17-year-old suspected of being the motorcycle-riding masked gunman was out on bail when the Tyler’s were mugged, said Capt. Ferdinand Acosta, who works in the criminal investigation department. Tyler was shot with a 40-caliber, semi-automatic weapon, Acosta said. The suspect could be arraigned this evening on attempted murder, robbery and weapons violations, depending on what prosecutors choose to move forward with. Kenyada Tyler, who is staying a local hotel, identified the suspect in a line up at the police station Thursday afternoon. We “have made the decision to forgive, and to realize that he’s lost. He’s lost his life. He’s lost his future. And we’ve lost, too. But we’re choosing not to let anger engulf our hearts,” Kenyada said in an interview after the police lineup. She described the crime in more detail, explaining how the masked gunman approached the couple, who were sitting on a park bench near a pond, and demanded money. The gunman pointed the gun at her, then turned his attention to Kendric. Kenyada used a bystander’s sweater to help stop the bleeding until paramedics could arrive and take over. She’s overwhelmed with tasks: coordinating care, finding the right size neck brace for her husband, helping a good samaritan bring by a piece of cheesecake for Kendric to eat, wondering how much of the transport and medical costs their health insurance will cover, keeping family and Kendric’s children updated. The gravity of the situation hits her hardest when she’s back at the hotel, alone. Far away from the vacation they’d imagined together, she now re-imagining a future with her football-player husband who is now helpless to care for himself. Kendric plays as a defensive lineman for the Anchorage Cowboys, a team within the Alaska Football League, which promotes amateur football. No real law enforcement at all.I live in p.r. and police are a joke looks like reno 911.they are worse than the criminals themselves.corrupt all the way to the top.